As the name implies, a power amplifier is designed to deliver a large amount of power to a load. To perform this function, a power amplifier must itself be capable of dissipating large amounts of power; that is, it must be designed so that the heat generated when it is operated at high current and voltage levels is released into the surroundings at a rate fast enough to prevent destructive temperature build up. Consequently, power amplifiers typ,~ally contain bulky components having large surface areas to enhance heat transfer t-9 the environment. 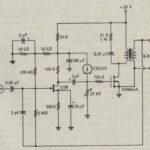 A power transistor is a discrete device with a large surface area and a metal case, characteristics that make it suitable for incorporation into a power amplifier. A power amplifier is often the last, or output, stage of an amplifier system. 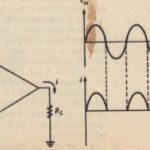 The preceding stages may be designed to provide voltage amplification, to provide buffering to a high-impedance signal source, or to modify signal characteristics in scrne predictable way, functions that are collectively referred to as signal conditioning. The output of the signal-conditioning stages drives the power amplif ,which in turn drives the load. Some amplifiers are constructed with signal-co stages and the output power stage all in one integrated circuit. Others, especially those designed to deliver very large amounts of power. 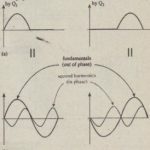 have a hybrid structure, in the sense that the signal-conditioning stages are integrated and the power stage is discrete. 1. Signal distortion occurs because of the change in amplifier characteristics with signal level. 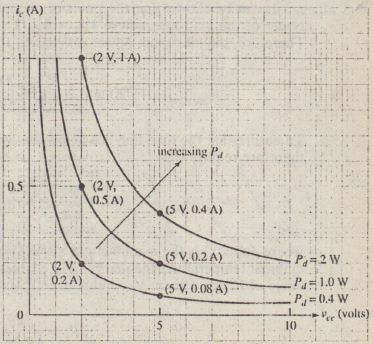 Harmonic distortion always results from such nonlinear behavior of an amplifier (see Figure 5-16). Compensating techniques, such as negative feedback, must be incorporated into a power amplifier if low-distortion high level outputs are required. 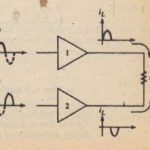 As a final note on terminology, we should mention that the term large-signal operation is also applied to devices used in digital switching circuits. In these applications, the output level switches between “high” and “low” (cutoff and saturation), but remains in those states most of the time. Power dissipation is therefore not a problem. Either the output voltage or the output current is near 0 when a digital device is in an ON or an OFF state, so power, which is the product of voltage and current, is near 0 except during the short time when the device switches from one state to the other. On the other hand, the variations in the output level of a power amplifier occur in the active region, between the two extremes of saturation and cutoff, so a substantial amount of power is dissipated. Recall that power is, by definition, the rate at which energy isconsumed or dissipated (1 W = 1 J/s). If the rate at which heat energy is dissipated in a device is less than the rate at which it is generated, the temperature of the device must rise. In.electronic devices, electrical energy is converted to heat energy at a rate given by P = VI . watts, and temperature rises when this heat energy is not removed at a comparable rate. Since semiconductor material is irreversibly damaged when subjected to temperatures beyond a certain limit, temperature is the parameter that ultimately limits the amount of power a semiconductor device can handle. Equation 16-1 gives, fOT” all practical purposes, the total power dissipation of the transistor. For a fixed value of P«, the graph of equation 16-1 is a hyperbola when plotted on Ic – VCE axes. Larger values of P, correspond to hyperbolas that move outward from the axes, as illustrated in Figure 16-1. Each hyperbola represents all possible comhinations of Vel, and lc that give a product equal to the same value of PIt. The figure;shows sample coordinate values Uc, Vet:) at points on each hyperbola. 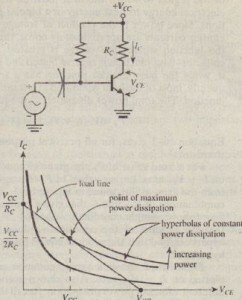 the hyperbola corresponding to the maximum permissible power dissipation. When the load line meets this requirement .. there is no possible combination of collector voltage and current that results in a power dissipation exceeding the rated maximum. It ean be shown that the point of maximum power dissipation occurs at the eel/tel’ of the load line, where Va = Vcc/2 and Ie = Vcc12Rc (see Figure 16-2). I. 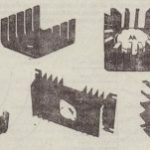 What maximum power dissipation rating should the transistor have? 2. If an increase in ambient temperature reduces the maximum rating found in (1) bv a factor of 2, what new value of Rc should be used to ensure safe operation?